Prince al Waleed bin Talal has announced a donation of more than half a million dollar to a local football club two weeks after his release from detention in royal court headed-crackdown on corruption. “Answering my brother Turki al-Sheikh’s invitation to support Saudi clubs … I present 2m Saudi riyals ($533,333) to support Al Hilal FC”, the Saudi billionaire announced Tuesday on twitter. The powerful businessman also posted a picture of himself and his family watching a football match. Turki al-Sheikh heads the kingdom’s General Sports Authority. He is believed close to Crown Prince Mohamed bin Salman who oversaw the anti-corruption crackdown, reports say. 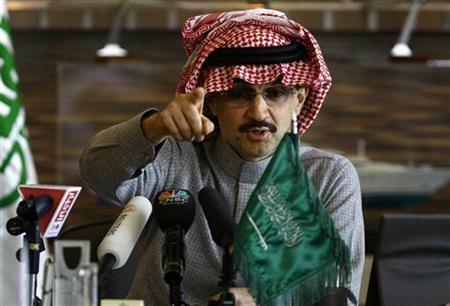 Prince al-Waleed, whose fortune is estimated at $17 billion by Forbes magazine, was rounded up last November alongside dozens of other princes, senior officials and business tycoons. After a three-month detention, most of the detainees have been released after they inked monetary settlement deals with the Attorney General who headed the purge. The Attorney General said authorities had been able to garner over $100 billion from the anti-corruption campaign. Written by: KanelkaTagba on February 14, 2018. Posted by KanelkaTagba on Feb 14 2018. Filed under Gulf News, Headlines. You can follow any responses to this entry through the RSS 2.0. Both comments and pings are currently closed.